Diagnosis of these spectrum of injuries can be challenging and are easily missed in presence of other associated injuries requiring urgent attention or due to inadequate interpretation of radiographs of the wrist. Early diagnosis and treatment is the key to prevent complication. Department Of Orthopaedics, Kasturba Medical College, Manipal. India. Department Of Orthopaedics, Manipal Hospital-Bangalore. India. Assistant Professor, Department Of Orthopaedics, Kasturba Medical College, Manipal- 576104, Karnataka – India. Introduction: Perilunate and lunate dislocations are uncommon high energy injuries and have extensive soft tissue, cartilaginous and bony damage. The most common pattern is trans-scaphoid perilunate fracture dislocation which constitutes approximately 50% of these injuries. Unusual injury pattern like Scaphocapitate syndrome can occur with fracture through scaphoid waist and capitate that rotates the proximal capitate 180° so that its proximal articular surface points distally. With this case report, we would like to present a novel presentation of an uncommon wrist injury. Case report: We present a case of simultaneous lunate dislocation in one wrist and perilunate fracture dislocation (Scapho-capitate syndrome) in the contralateral wrist which occurred simultaneously in a young male following a two wheeler accident. The injury was missed initially at the primary treating centre. 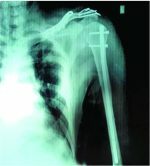 Upon diagnosis, the patient underwent open reduction and internal fixation along with ligament repair. The patient was subsequently followed up for a period of four years and was found to have very good clinical and radiological outcome. Keywords: perilunate dislocation, scapho-capitate syndrome,trans-scaphoid perilunate fracture dislocation. Perilunate injuries are high energy trauma resulting from motor vehicle accidents, fall from height or sporting event affecting active young people . These injuries combine bony avulsions, ligament disruption and fractures in different forms. The most common pattern is trans-scaphoid perilunate fracture dislocation which constitutes approximately 50% of these injuries. Volar lunate dislocation represents the last stage of perilunate instability which tends to occur when all ligaments around the lunate are disrupted due to higher velocity of injury . Unusual injury pattern like Scaphocapitate syndrome can occur with fracture through scaphoid waist and capitate that rotates the proximal capitate 180° so that its proximal articular surface points distally . We report a case of simultaneous volar lunate dislocation of one wrist and perilunate fracture dislocation of the other in a young patient following a fall from a two wheeler. This combination of injury is exceptionally rare. We would also like to highlight the fact that these pattern of injuries are commonly missed initially and the patient may present at a later date with secondary complications like stiffness, avascular necrosis and arthritis of the wrist. Due to complex anatomy and misinterpretation of the radiographs, reported risk of missing initial diagnosis in perilunate injuries is as high as 25% [1, 2]. Hence, accurate diagnosis and timely treatment is required to prevent the secondary complications arising from these injuries. A 20-year-old male presented at our clinic with pain and swelling of both wrists of 10 days duration following a two wheeler accident. He fell on outstretched hand on the right side and on his dorsum of left wrist. He was initially evaluated with X-rays at a local hospital, and was reported to be normal. Hence, he was treated with a below elbow slab. In view of persisting pain, he came to our centre for a second opinion after a period of 10 days. On examination, there was marked swelling and tenderness on the volar aspect of the left wrist and tenderness with crepitus of the right wrist. There was no neurovascular deficit on either side. The radiographs of left wrist showed volar lunate dislocation (Fig. 1) and that of the right wrist showed a trans-scaphoid trans-capitate dorsal perilunate dislocation (Scapho-capitate syndrome) (Fig. 2). The CT scans of the both wrists were done to confirm the diagnosis. 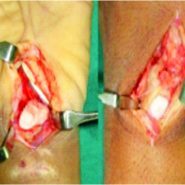 On the left side, open reduction of lunate byvolar approach followed by atranscaphoid and transtriquetra K-wire into the lunate and repair of the vola rscapholunate ligament and the capsule was done (Fig. 3). On the right side, Herbert screw fixation of scaphoid by volar approach was done. A separate dorsal approach was used to expose the perilunate dislocation. The proximal part of capitate was found to be fractured with its articular surface facing distally. Repair of the capsule and dorsal ligaments were done after fixation of the fracture and reduction of perilunate dislocation with K-wire. Post operatively, he was immobilized in a cast on both the sides (Fig. 4, 5). K-wires were removed at six and eight weeks from the left and right side respectively and mobilization of the wrist was started. The clinical and radiological evaluation was done at regular intervals over a three year period (Fig. 6, 7). Lunate showed no signs of avascular necrosis. Cooney’s wrist score which includes variables like pain, wrist range of motion and grip strength was good in both the wrists (Table 1). Perilunatei njuries are uncommon and their defining feature being dislocation of the capitate head from the concavity of the distal lunate . They occur due to extreme extension of wrist associated with variable degree of ulnar deviation and radiocarpal or midcarpal supination . These injuries can occur as lesser arc perilunate dislocations which are characterized by pure ligamentous injuries around the lunate or greater arc perilunate fracture dislocations, which are characterized by fracture of one or more bones around lunate . According to Mayfield, the disruption of ligaments due to perilunate dislocation follows the progressive perilunate instability, which begins radially and propagates around or through the lunate to the ulnar side of the carpus . When all the perilunate ligaments are torn, only the dorsal capsule and palmar radiolunate ligaments can hold the lunate in place. Once the strong palmar radio lunate ligaments are torn, it results in lunate dislocation . Volar lunate dislocation represents the last stage of perilunate instability in a continuum of progressive ligamentous and bony damage. Our patient had volar lunate dislocation in the left wrist and transscaphoid-transcapitate dorsal perilunate dislocation on the right side (Scapho-capitatesyndrome), which are injuries of the same spectrum but were suggestive of higher velocity of injury in the left wrist compared to the right side . These variations depend on the direction and amplitude of the deforming forces, anatomical differences in carpal bones and the status of ligaments and muscles when the injury was sustained . Though bilateral perilunate dislocations and bilateral lunate dislocations have been previously reported, this combination of simultaneous lunate and perilunate dislocations of both wrists is extremely rare [7, 8]. These high energy injuries need accurate diagnosis, early and aggressive treatment in order to prevent complications . Despite the severe nature of injury, diagnosis can be difficult as it was missed in our patient at the previous hospital in spite of X-rays. A multi centre review study of 166 cases showed that perilunate dislocations (PLD)/perilunate fracture dislocations (PLFD) were missed in 25 % of the patients . These injuries are commonly missed due to other associated injuries requiring urgent attention or inadequate interpretation of radiographs of the wrist. This emphasizes the fact that a thorough knowledge of wrist and carpal anatomy and their radiological assessment is very important in identifying and diagnosing PLD/PLFD. Currently, most clinicians agree that closed reduction cannot reliably restore the complex anatomic inter-carpal relationships sufficiently to prevent complications . Recent literatures lay emphasis on accurate diagnosis, early open reduction, and restoration of carpal anatomy and repair of damaged ligaments [9, 10]. It is very important to restore the carpal anatomy as the vascular supply of the lunate runs predominantly through the palmar and dorsal ligaments. Dorsal ligaments are damaged at the time of injury and palmar ligaments are stretched and impinged upon by the post injury configuration of the proximal carpus . Anatomical reduction of lunate may relieve this vascular problem and avascular necrosis may be transient. The surgical approach can be volar, dorsal or combined volar and dorsal [9, 10]. There is no consensus of opinion in the literature about ideal approach and solely depends on surgeon’s expertise. In our case, we chose a combined volar and dorsal approach, wherein volar approach was used for open reduction of scaphoid and lunate and a dorsal approach for the fixation of fracture of capitate and repair of dorsal ligaments. Our patient has regained useful and painless range of movements at the end of four years of follow up without any signs of complications till date. It will be interesting to have a longer duration of follow up as complications like avascular necrosis of lunate and arthritis of radio-carpal joints have been reported as late as 12 years . These injuries occurring simultaneously in contralateral wrists are exceptionally rare as the mechanisms of injury are different on either sides. These are high velocity injuries and are often missed, especially in presence of other major injuries. Thorough clinical examination and careful evaluation of the radiographs is essential to diagnose these injuries and prevent complications. When detected and treated early patient can have a satisfactory functional outcome. 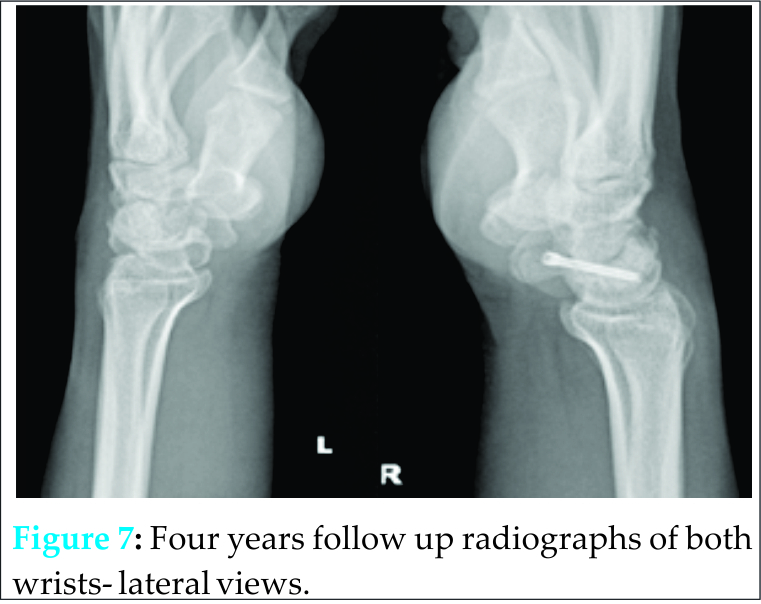 Diagnosis of this spectrum of injuries can be challenging and are easily missed in case of other associated injuries requiring urgent attention or inadequate interpretation of radiographs of the wrist. This emphasizes the fact that a thorough knowledge of wrist and carpal anatomy and their radiological assessment is very important in identifying and diagnosing PLD/PLFD. 1. Sauder DJ,AthwalGS,Faber KJ et al.Perilunate injuries Orthopedic Clinics of North America 2007:38(2):279-288.
dislocations: a multicentre study. Journal of Hand Surgery 18A:768-779. 3. Zonoozi E, Mazhar FN, Khazai M et al. Bilateral volar lunate dislocation- a rare case report. JRMS 2009;14(3);187-190. 4. Mayfield JK, Kilcoyne RK, Johnson RP. Carpal dislocations: Pathomechanics and progressive perilunate instability. J Hand Surg 1980;226-241. 5. Gracia-Elias M,Geissler WB. Carpal instability. In: Green D, Hotchkiss R, Pederson W, Wolfe S,editors. Greens operative hand surgery.Philadelphia: Churchill Livingstone 2005;535-604. 6. Dimitrou CG, Chalidis B, Pournaras J. Bilateral volar lunate dislocation. J Hand Surgery Europe 2007;32(4):447-9. 7. Spar I. Bilateral perilunate dislocations:case report with review of literature and anatomic study. Jtrauma 1978;(1):64-5. 8. Dean GS, Griggoris JM, Panayotis NG et al. Perilunate dislocation and fracture dislocation: A critical analysis of the volar-dorsal approach; J Hand Surg 199722(1): 49-56. 9. Berger RA, Wiess APC. Hand surgery.Philadelphian: Lippincott, 2004.pp.511-523. 10. Sotereanos P, Mitsionis GJ, Giannakopoulos PN. Perilunate dislocation and fracture dislocation: a critical analysis of the volar-dorsal approach .J hand Surg 1997;22:49-56.